Document Delivery and Information Services. Contents and links are provided at left hand side. This Virtual Library is dedicated to Academicians, Students, Researchers, and Librarians and Information Professionals. Twenty years experience as a Librarian in S. V. National Institute of Technology, (Deemed University), Surat, 395007. Gujarat. 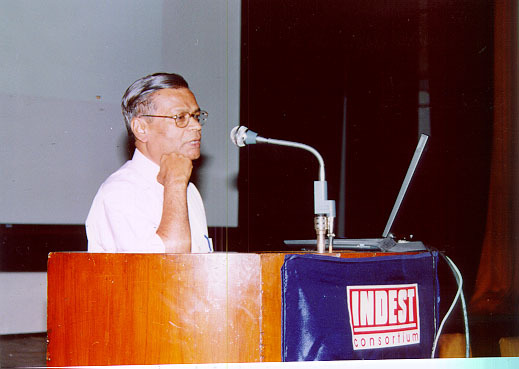 Retired from SVNIT on 30/11/2008 and again Joined in IBS (ICFAI Business School Hyderabad as Librarian posted in Ahmedabad Centre on 01/12/2008. 6. Ghosh, T. B. (2005) Open Archive Initiative and E-print resources on Computer Science in the Internet and its impact on research. In: XXV All India Conference of IASLIC, 26-29 Dec 2005, IIT Madras, Chennai. 7. Ghosh, T. B. (2005) An overview of open archive initiative and e-print resources on mathematics in the Internet. SIS 2005, XXIII Annual Convention and Conference, jointly organized by Department of Library and Information Science, Dr V.S.K.Library, Andhra University, Visakhapatnam and Society for Information Science, New Delhi during January 27-29, 2005. Pp. 628-639. 12. Ghosh, T. B. (2002) Online electronic information resources on business management. In Kaul, H. K. and Baby, M. D., Eds. Proceedings National Convention on Library and Information Network (NACLIN), pp 103-112 Available online at http://eprints.rclis.org/5635/3-112, Cochin (India).